Home Cooking and Snacks	Valentine’s Day! Valentine’s Day or better known as V Day. Do you survive? Are your kids CRAZY?! Do you get tons of hugs? I don’t like this holiday at all but I love seeing my kids express so much love! But boy am I always glad it’s over. My feet always hurt. My stomach hurts from the 60 cupcakes that we have. People, literally 60 cupcakes. We will still have cupcakes and cookies for days and days!! So today I wanted to share some ideas, activities and freebies to make Valentine’s Day in your class a success! We read The Day It Rained Hearts and Cloudy With A Chance Of Meatballs and do a Venn Diagram to compare and contrast the two stories! We also read LOTS of Valentine’s Day books! And since we love our sight words, we play a super fun sight word game using foam hearts from the Dollar Tree! For more details on this sight word activity, click the picture! We also make a bouquet of sight words to assess our sight words. These monthly sight word projects have become a huge hit in our class! The kids love them and the teacher loves the assessment piece of them! The students come to my table 1 on 1 and we go through all of the sight words we have learned so far. I mark the rose for each word they read. They color and cut them out and make a bouquet of sight words! We love to measure so we Measure Love using non-standard units! To practice addition and subtraction, we use these fake roses and play Cupid! For more information and details and a video of this amazing activity, click the images! And of course we measure ourselves to see how many “kisses” tall we are! Here’s another fun, hands on candy math activity for you to check out! Of course, we have to meet those standards, even on a special, chocolaty day! So we sort and graph our candy hearts! Then we analyzed the data. We learn that the orange hearts are the ones that we have the least of! Why do the candy heart makers hate the orange?! And then of course, we eat the hearts! Of course we make bags to collect our Valentine’s cards! Ya’ll know how much I believe in SIMPLE! Our bags are no different! We make super simple monster bags! No fancy boxes or mailboxes. Good ole paper bags and some fun monsters! And no celebration is complete without a silly hat! These hats are made with red Solo cups, some heart eyes and funny legs. Then we staple a piece of elastic onto the bottom of the cup to make a strap! We make Valentine’s Parfaits using white cupcakes, whipped cream and pink frosting! And don’t forget the sprinkles! Give the kids a pair of socks and a pencil! Super simple and cheap and FUN! And wear a shirt with the kids names on it! Check out this post for more hands on, engaging Valentine’s Day centers! Want even more Valentine’s Day ideas, activities and resources? Check out this post! 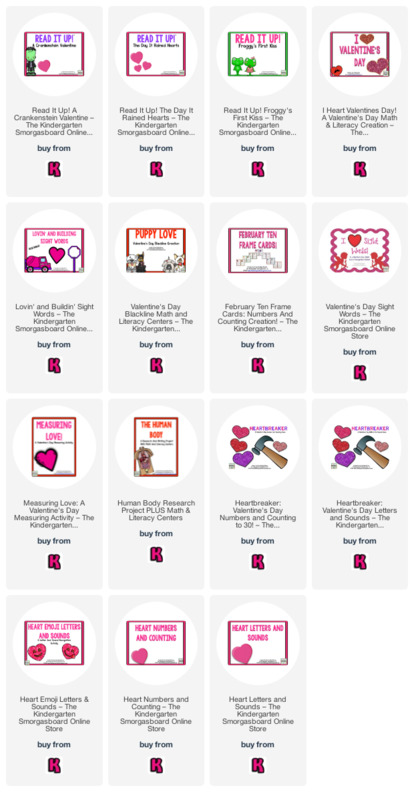 For Valentine’s Day math and literacy centers and resources, check out these creations! A Kindergarten Smorgasboard Saturday Kindergarten Post! Nice house! Good luck moving. Its such a pain to pack and unpack. Congrats on your new home! It's lovely! So glad to see your kinders had an amazing day! Beautiful home! Congratulations! Looks like you guys had a great day! That house is gorgeous! So excited for you. Can't wait for the inside pics. I'm going to have to steal that sock idea for next year. OMG the picture of the plate of cookies, cupcakes etc. makes my tummy ache just looking at it. I love the greeting that you did during morning meeting, I'll have to try that out with my kiddos. I'm hosting a linky for people to share their Valentine's Day pictures, I'd love for you to link up this post if you have time. Enjoy your weekend and CONGRATULATIONS on your new house. Oh I LOVE that hat and the house is gorgeous! So envious. I want to see pictures. I love your blog! I will be back to visit it often. Thanks for sharing. Congrats on your new home. Seems like yesterday I was reading about a wedding. I enjoy your blog and would like to be a fly on the classroom wall. But alas, your too far so I'll just keep on enjoying the blog.